Relating | Energy, Economy, & Ecology | Our collective consciousness, our relationship to nature and our environment. On the essentials of our human civilization, our soil. Excellent article which includes the value of biochar and it’s contribution to soil and society. This was a speech I gave at the Harmony in Food and Farming conference in Llandovery, Wales in July 2017. Please click here to see video clips of the Prince of Wales, Patrick Holden and myself during the conference, which was organized by The Sustainable Food Trust. It aimed to develop an agricultural perspective on the ideas propounded in the book ‘Harmony’ by HRH The Prince of Wales and Tony Juniper. Interview with Nora Bateson about Systemic Leadership- this is a little bit radical. Source: Interview with Nora Bateson about Systemic Leadership- this is a little bit radical. The unfolding and increasingly tragic refugee crisis is creating a profound awareness around the war in Syria. Not to be forgotten are refugees from Afghanistan, Iraq, Pakistan, Yemen, and Eritrea, also risking their lives to reach Europe. What do these refugees have in common? The narrative is that these peoples have lost their homes and livelihood after a wave of conflicts originating from a desire to introduce democracy in repressive totalitarian governments and dictatorships. This allows us to see these refugees as fleeing from something of their own making, something they are responsible for and that we, in the developed European countries, must now pay for. In this narrative, it’s them wanting something from us, and us taking the role of savior, helping them in their time of need, while making us heroes of the downtrodden, the poor, and needy. This fits well in the Judeo-Christian narrative of the superior culture helping an inferior culture, the good versus the bad, the enlightened versus those who live in darkness. Is it that simple? Well simple is good, after all, it’s a simple story, simple to write, to tell, and most of all, makes us in the west feel good about ourselves. Well, at least some of us. There is a less pleasant consequence of this narrative. It’s the growing popularity of the far right ideologies, the right-wing political parties who tell their supporters how this influx of refugees will take away their freedom, their jobs, even take over their culture. Emboldened by the rhetoric, some are taking matters into their own hands; refugee camps in Germany and Sweden are being set on fire, daily protests and hate speeches are fuelling the fear and inciting more violence against the newcomers. Meanwhile, there is no statistical evidence or studies that support these fears. More to the contrary, studies show the opposite. Numerous historical statistics show that refugees actually increase economical activity and enrich host countries through new business, more taxes being paid into the national coffers, and more importantly, increasing the cultural diversity which leads to new approaches and innovative solutions in business. A famous example is the late founder of Apple computers – the worlds largest company – and billionaire Steve Jobs, who was adopted from Syrian immigrant parents. But what if the narrative is incomplete? What if there are other factors involved? What if we were to question this narrative and look for other factors that could be influencing this tragedy that is causing the greatest mass migration since World War 2? Energy would be on the top of my list. Interesting thing is, Iraq is in the middle of the Middle East, and very much a producer of the black gold, petroleum. It’s been 25 years since the Gulf War involving Iraq and Kuwait started, and then came operation Desert Fox in 1998, and then the Iraq War started in 2003, lasted until 2011 when it turned into an insurgency… The first wave of refugees came from Iraq and went to Syria and numbered more than one million (diffucult to say how many Syrian refugees are Iraqi). 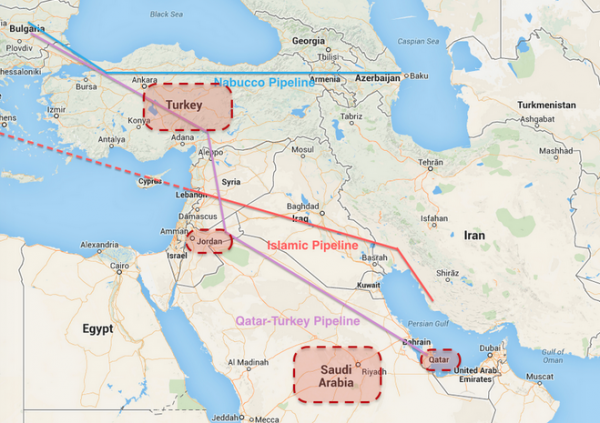 Syria and Afghanistan are important gateways for the oil, so they have had their share of war, interestingly both heavily involved with Soviet and today Russian interests, most recently in the case of Syria. Why all these wars? Well it wasn’t because of any “Weapons of Mass Destruction” (there weren’t any). The wars have certainly been, however, and continue to be a “Weapon of Mass Distraction”. I don’t see much talk in the main stream media about the connection between oil and the refugees. Why? Western nations have been involved in the Middle East since World War One and the then secret Sykes-Picot Agreement (1916), which drew lines across the desert regardless of differences in language, culture, religion or politics. It almost seems that instability in the region was the main goal, and it succeeded. Divide and Conquer. With more than 30% of the world’s oil coming from the Middle East, and most of that fuelling our modern western economies, it might be fair to ask whether we share some responsibility in the refugee crisis now facing Europe and the world. Ecology, and how we depend on the environment is another question that is very much relevant to the refugee crisis. And it’s not only the fact that burning fossil fuels, including the oil from the Middle East, is the main cause of Climate Change. It’s the fossil fuels, the oil and the coal, which has made it possible for us in the west to develop our booming industry and affluent economy to provide us with all the comforts we enjoy. Thank you people of the Middle East! The downside is Climate Change, which has lead to more than sixty million refugees and displaced persons worldwide, to date. Among these are the four million refugees and eight million displaced persons from Syria – more than half that country’s population. It is becoming increasingly clear that the drought which afflicted Syria between 2006 and 2009, the worst in that country’s history, caused between one million and one-and-a-half million farmers and their families to move to the cities, where there was already a water crisis. In addition to the refugees from Iraq, this didn’t help the social and economical stability of Iraq. Which brings us to the Economy. It’s no news that the world’s economies are in trouble, and that it’s been ongoing (yes, it’s still the same crisis) since before the collapse of Lehman Brothers in the fall of 2008. This was just the drop that made the cup run over, and the world banks and governments have been trying to bring the economy back on track ever since. The latest crisis in Greece has shown us that the problems are systemic, that is, it’s the system that’s broken, and any quick fixes in a broken system won’t, and can’t last. The present pressure on governments created by the refugee crisis, as a result of failed global energy management (i.e. fossil fuels), which in turn is responsible for much of our Climate Crisis, and putting additional strains on the world financial systems, is in short, a tremendous challenge. It has come up in the 2009 (Putin’s address) and 2013 Davos World Economic Forum (Global Risks 2013 Report): it might just be a “Perfect Storm”. But crisis are also opportunities. Yes, if we are willing to put the dots together, and reflect on these facts, maybe we start to see the refugee crisis as an opportunity to question our lifestyles and look at the core issues affecting our planet. How we choose to do this work, from what level of consciousness, may determine the future of the human species on the planet. Let’s change the narrative, let’s take a collective responsibility and work with compassion and respect. And don’t be surprised if the next Steve Jobs is waiting in one of those refugee camps between Syria and Sweden. I invite you to do some research of your own on these subjects (there is plenty material if you ask the right questions), and I would love to hear from you! Tovarnik, and Ilača, on the northeastern corner of Croatia. It was past dark when we arrived on the Croatian side of the Serbian border, at Ilača. The eight-hour drive from Vienna with four volunteers from SOS Konvoi, a.k.a. “Der Geheime Kunstsalon” (The Secret Art Salon) provided an opportunity to get to know each other, talk about the experiences from their last convoy to the border area, and discuss some opinions on the refugee crisis. As I sit writing these lines, I have been welcomed into the very clean and modest home of a middle aged Croatian couple, Martin and Nancy, I have been fed a delicious meal, given fresh sheets and a comfortable sofa to sleep on, and a password for the house wi-fi network. Nancy introduces herself as “Mama” for the volunteers, as many as twenty at a time, who have filled the house since last Wednesday, when the Hungarian border at Röszke closed and refugees were diverted to the nearby border crossing at Tovarnik. Nancy and Martin are truly heroes in this surreality, in Europe in the year 2015. The volunteers are also heroes, young men and women between 25 and 35, most of them, who have simply organized themselves into loose and flexible groups, filled their cars and driven to make-shift camps to hand out food, clothes, tents, sleeping bags and necessities to whole families, wandering refugees and migrants. The main stream media and news has slowly awakened to cover the plight of the refugees, a tragedy which is getting worse as the weeks pass and winter approaches, while governments and larger NGO’s seem unable (or unwilling) to mobilize and provide a basic infrastructure for effective aid relief. This is the largest refugee crisis since the second world war, and I find myself here on this border which saw some of the most brutal and savage battles during the Bosnian war just two decades ago. I see the bombed out shells which used to be houses from that time. 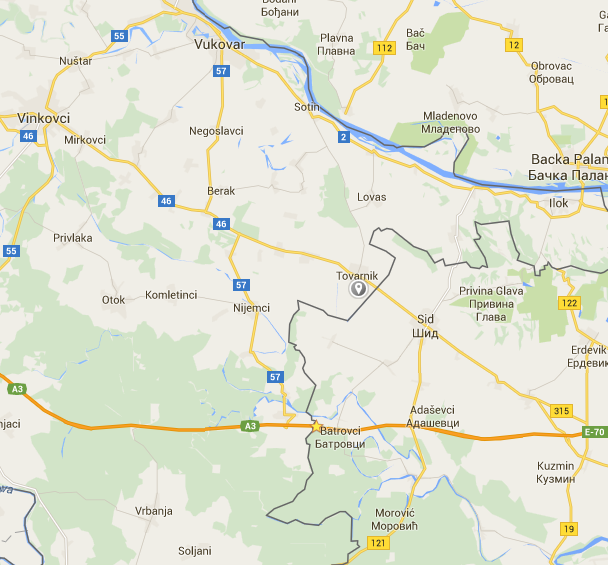 Osijek, Vukovar, and Brčko are the names of the towns which were in the news then. Today it’s Tovarnik, Opatovič and the nearby villages with open-air make-shift camps doing what they can to provide for the thousands of migrating refugees. It’s worthy of mention that whereas the European Union isn’t able to organize itself and provide some relief to refugees, the volunteers who are providing some relief today can rely on a roof over their heads and warm meals from people like Nancy and Martin. Two people providing some infrastructure of relief where the European Union, so far, has failed. The Power of Polarity refers to the power which results from delving deeply, very deeply into a subject, having the courage, and persistence of going very deeply into a subject, getting the facts, looking at all the angles, the good and perhaps especially the bad, and allowing these perspectives to co-exist, without defending, or offending, while holding the space and allowing something new to emerge. This process of emergence can be called Dialogue, a dynamic resonance of sorts. The Power of Polarity became clear to me during a recent road trip with my daughter from Berlin to Wendland. Developing both renewable and conventional energy to fuel the growing needs of a modern society is now the road most travelled by both green and conservative politics, and big business – for different reasons. Our visit to the region of Wendland in northern Germany provided unexpected insights into the Power of Polarity and “Limits to Growth”. We witnessed how community, and more importantly, nature, prevails. Christa Tornow, a neighbour in Vietze, showing us the mussel shell she just found. “Look what I found!” she called out over the blue fence posts. 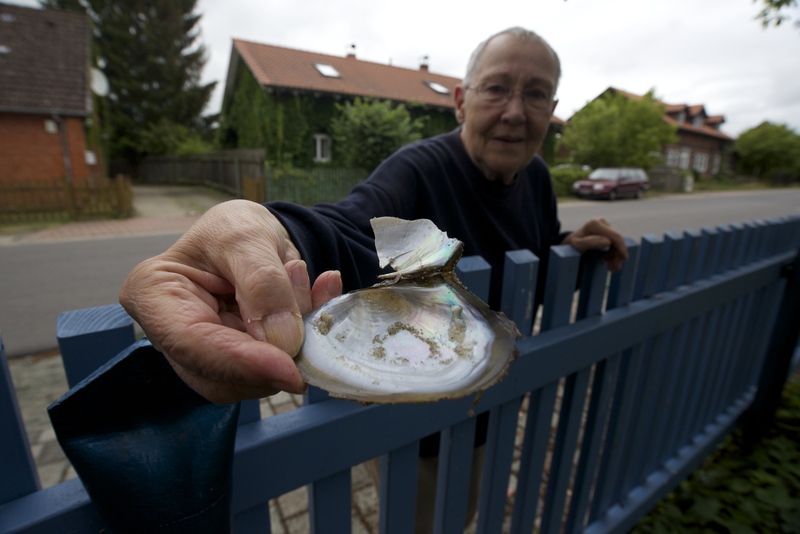 Christa Tornow was showing the mussel shell she had just found along the Elbe, Germany’s second largest river after the Rhine. We were sitting in the garden of our host Barbara Tietze, in the village of Vietze, drinking tea, and discussing the environment. “When I arrived here in 1980, the fisherman in the village had a sign: “Fish guaranteed not from the Elbe”, Christa continued, referring to the pollution in the river, “and now this!”. When it comes to the environment, there are indeed good things happening in Germany, especially in renewables, and it’s a good reason to celebrate. I was still high from driving along the old highway five from Berlin the day before. Normally it takes two-and-a-half hours on the autobahn, but we chose to take the slower road, taking us five hours, and not regretting it. Alexandra had just finished her bachelor’s degree in geography and is about to begin her master’s in land restoration, so this was an educational road-trip for both of us. Centenary oak trees line the two-lane country road, often creating long green tunnels only to open and reveal enormous wind turbine parks dotting the surrounding fields of swaying golden wheat on both sides. Germany leads in renewable electricity, with more than 30% supplied by wind turbines, solar panels, and biogas generators. But all is not well in this renewables paradise, as we were about to learn from some of the people we met during the next few days. Wendland is a region in Niedersachsen that lies south of the Elbe River, west and north of former Eastern Germany, or DDR. It’s just about in the middle of the triangle formed by three of Germany’s largest cities: Berlin, Hamburg, and Hannover. Before German reunification Wendland was in the easternmost protruding “wedge” of Western Germany, being surrounded on the other three sides by the DDR. This came to influence the region, in particular as regards the choice of the town of Gorleben as the site for nuclear waste disposal for Germany. Originally intended for international nuclear waste disposal, the people of Wendland think differently, and they show it. Arriving in Gorleben, from Vietze. 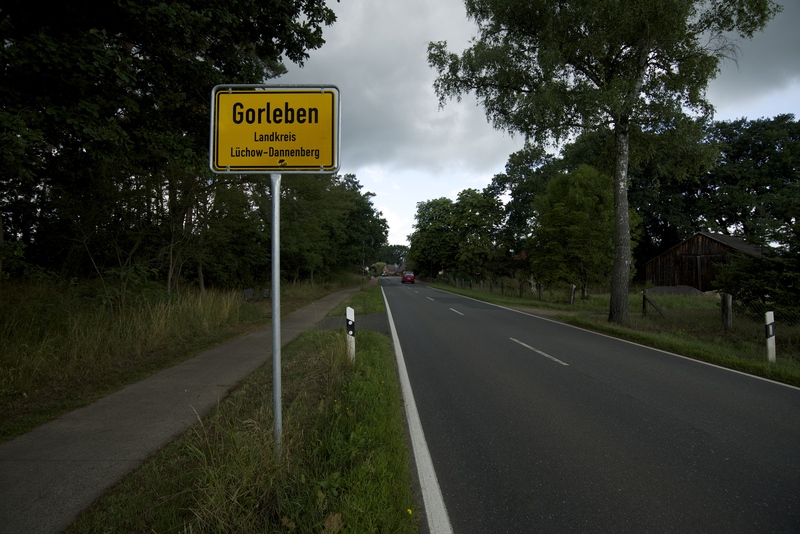 It was 1977 when the German government began exploring the possibility of locating its nuclear waste site to Gorleben, a town of some 600 souls with agriculture at the time it’s main commercial activity. Protests began in 1980 with the pronouncement of the “Free Republic of Wendland”, a camp of protesters in front of the proposed site that was dispersed after two weeks of occupation. The first casks, or “castoren” arrived in 1995 and mobilized 4000 protesters and 7600 police. Two years later a transport that included six containers attracted 10,000 protesters and 30,000 police (Wikipedia). This scenario is in stark contrast to the impressive wind turbine parks, solar panel parks, and biogas installations today that as a result seem an even more important sign of a successful transition from fossil fuels and nuclear power to renewables. With “net-generation from renewable energy sources in the German electricity sector increasing from 6.3% in 2000 to about 30% in 2014, Germany has earned the superlative: “the world’s first major renewable energy economy”” (Wikipedia). Driving from Berlin to Wendland, we passed several wind turbine parks. These clouds were perhaps a sign of the storms that lay ahead in the renewable energy debate. These impressive figures come to light as I do some research before writing these lines. Hearing the story of Gorleben and it’s nuclear waste disposal site evolve during a rainy morning “große Stadtrundfahrt” (big city tour) with our host and new-found friend Barbara Tietze, well, I felt a chill run down my spine. The experience in Gorleben illustrates for me the end of the road, the writing on the wall, the final piece of the puzzle in the debate on energy alternatives in this age of growing awareness about sustainability and resilience. And it is by no means over. To date 113 “castor” containers are being stored in Gorleben, part of the 243 containers being stored above ground in Germany. Each of these containers holds as much radioactivity as the total of what was released in the Chernobyl disaster in 1986 (Handelsblatt). I grew up with the Three Mile Island USA (Pennsylvania) partial meltdown in 1979, and besides Chernobyl, we now have the Fukushima Daiichi meltdown in 2011, which is still a ticking bomb. What to do with the radioactive waste? 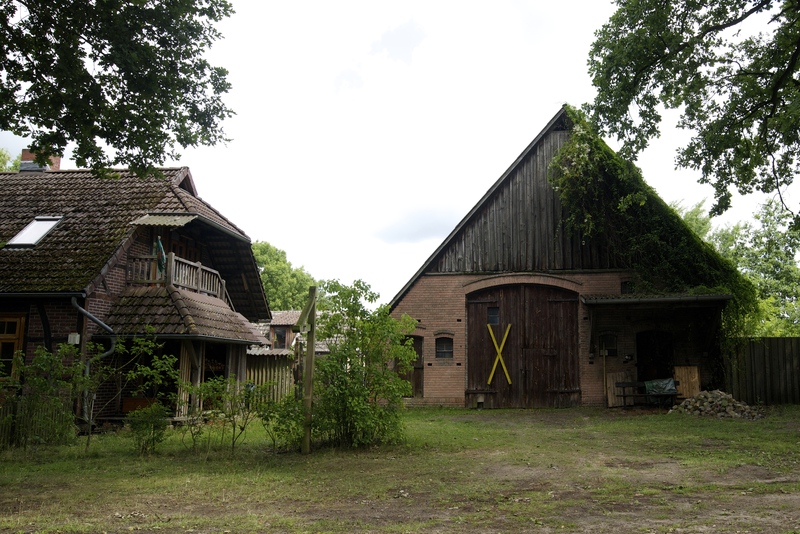 Confronting these facts while driving through the pristine forests and green fields of Wendland seemed surreal. How do we, a collective society in one of the supposedly most developed and educated regions in the world, manage to ignore this situation? Here is a polarity of extremes. On the one hand, the facts of the nuclear power industry together with the worlds most successful renewables industries, generating power at any cost, and it just not being enough. On the other hand, de-growth, sustainable development, in harmony and balance with the resources available on the planet. This polarity seems clearly on the minds of the people of Wendland, where the resistance to what Gorleben stands for has helped build a strong community, with many inspiring initiatives to bring people together. Kulturelle-landpartie (http://www.kulturelle-landpartie.de/) is one of the better-known yearly festivals (the week between Ascension and Pentecost), bringing people together to witness the creativity of artisans and local handicrafts, art, music and the beauty of the landscape in Wendland. It’s clear that a sustainable, harmonious, beautiful, and high quality life style is possible. The UN recently released a report on the efficiency and advantages of organic farming (UNCTAD Report). It’s further clear that we have more energy than we need through renewables – although not necessarily enough for our greed… So what is it that keeps us in the grips of unsustainable business, lifestyles, and behavior? Could it be that our level of technological development, our material wealth, our comfortable lifestyles (which aren’t as comfortable as they could be) make us choose to close our eyes, forget, and hope for the best? It seems this polarity is growing greater and greater, until the polarity, the distance between the extremes between a planet in balance, and a planet out of control, is reached where the collective consciousness (and nature) has no more choice than to react, a massive popular (and natural) “reaction”. Will this usher in a more mature, responsible, and safe way of working together with nature. How far down the road must we travel, how much destruction is needed before we wake up? Energy and electricity are two different things. Filling Germany’s electricity needs by 30% with renewables translates to just over 11% of Germany’s “primary energy consumption”, presently accounted for through biomass, biogas, biofuels, hydro, wind and solar (Wikipedia). So this technological “wunderkind” Germany still uses fossil fuels (oil and gigantic amounts of fossil coal) and nuclear to provide the other 89% of its energy needs, in 2015, the year every metric on the planet is saying we have to go “cold turkey” on fossil fuels to have a chance and maintaining conditions for humanity to survive on the planet. It’s a wake-up call. A big one. 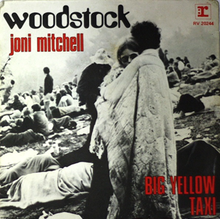 Is anybody listening? Not many it seems, at least not the people in the places where decisions are made. Big business is still big on growth, and their political lackeys still repeat their mantra: “We need growth to create more jobs, to create more prosperity, to sustain our life quality…”. Well, do we? 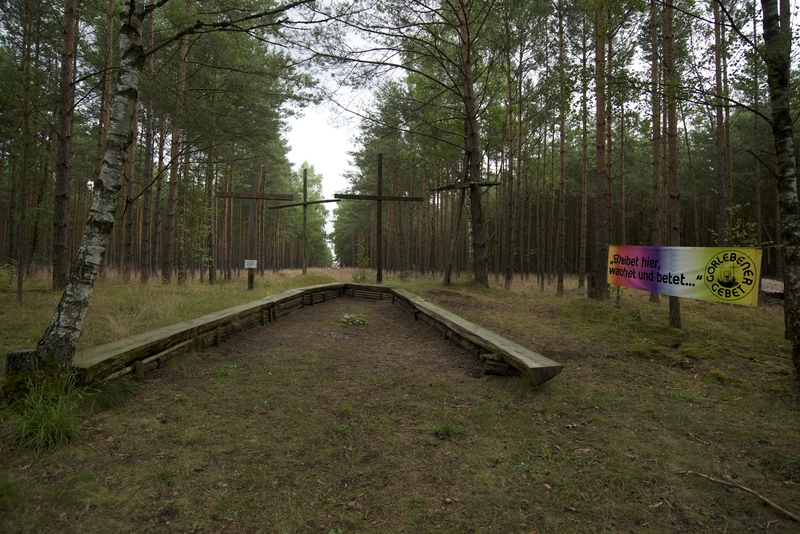 Those who protest against the Gorleben nuclear waste disposal site show this by painting a yellow cross and exhibiting it on their property and/or business. That’s the question. Do we need THAT kind of growth? Or is there another kind of growth? The growth which grows out of insight, out of community, out of people coming together in a common cause – like the survival of the human species on this planet!? This is what I experienced during those days in Wendland. And this is what I realized I had to thank Gorleben, and all the activists, and the local population, for standing up and creating awareness on these questions of such vital importance. This other growth has to do with values, living values, taking responsibility, being respectful, compassionate, and loving, to myself, others, and the environment for which my life depends, the air, the water, the soil, and other beings. This growth can be very rewarding, and comes from making choices; sometimes they are choices that go against the “normal”. I believe that we all have these choices, all the time, but we don’t necessarily always listen to them. Part of my personal growth happened while living in California, on the west coast of the USA in the mid-eighties. I remember one day driving down the highway in convertible and thinking: “wow, this is the life”. I was writing screenplays and working three other jobs to pay the rent, and was very happy. My then wife Kathrin was also working hard at growing in her career as a travel agent, working overtime, weekends. We lived one block from the Pacific Ocean and would walk down in the evenings with a glass of wine and together with the neighborhood applaud the sunset, each one better than any before. We were living the American dream! And Kathrin was pregnant. We had it all planned: a “day mom” would care for the baby while we both worked at getting ahead and becoming even more successful at our “American Dream”. And then Christiana was born, and everything changed! This precious, beautiful, miracle of a child had chosen us to be its parents! We were not going to hand her over to someone else to raise, not even for a few hours a day! Six months later we said good-bye to the American Dream and moved back to Spain, where my mother lived, and closer to Kathrin’s family in Austria. For all the material wealth and great times, and many friends, the USofA was just that, too material. Twenty-eight years later, I’m still learning, but what we discovered then with the birth of our first born (and reminded again with Alexandra, born two years later), that there are certain values we want to live in our lives, is still the guiding principle for my choices. The “Gorleben Gebet” – place of prayer. Another insight from these days in Wendland was the “all-inclusive” cost of the renewables, in other words, including externalities; the costs that don’t show up on a corporate balance sheet. A large proportion of the fields we drove past were planted with corn. Enquiring, I was told it wasn’t food corn, but rather biomass for the biogas plants. When harvesting time comes, hundreds of trucks rumble by on the small country roads, delivering the stalks to be ground up and thrown into the fermenting vats. Besides the damage to the roads, it’s a noisy, smelly, and dangerous business. Sustainable? How many acres of land would need to be planted to provide enough biogas to make a difference? A similar paradox is to be found around the wind parks, with an incessant humming which can be heard from a remarkable distance, so far in fact that laws are being heatedly debated to limit the number and positioning of the wind turbines. One suggested legislation is the “x10” rule (ten times the height of the wind generator minimum distance), another is forbidding wind turbine parks to be erected less than seven km. apart. This legislation will limit how many wind turbines are installed and puts in question how Germany will be able to fulfill it’s promise of removing its nuclear power plants completely (announced by Chancellor Angela Merkel after the Fukushima Daiichi meltdown) (Handelsblatt). What I’m getting at here is that you do the math, and even though in theory we could compensate for the other 89% of energy needs in Germany (more difficult in other countries) now being supplied by fossil oil and coal, where would we put the solar panels, and wind parks? And what would be left to grow food? Do the math, infinite growth on a finite planet doesn’t add up. And while we do the math, what will be done with the 400 tons of nuclear fuel waste every year, or if the phase-out plan announced by Angela Merkel should hold, the 17,200 tons of spent fuel rods which will be left, and remain radioactive for thousands of years (Spiegel Online)? In Germany in the early eighties, the nuclear power industry was hard at work helping German industry grow, and didn’t think much about the needed storage for its spent nuclear, and radioactive fuel rods. Millions of years ago salt deposits were formed deep under the pine forests of Gorleben, and this was thought a safe resting place for the casks containing the spent radioactive fuel rods, each with the energy equivalent of sixteen Hiroshima bombs (or what leaked out of Chernobyl). It has since been repeatedly established that the salt dome is geologically unstable, and therefore highly unsuitable and dangerous for the storage of this radioactive waste. It has also come to light that it was perhaps, more than a geologically suitable place, rather a politically suitable place, considering the sparse population and proximity to the former East Germany (DDR). A real and present danger to the local population (and Chancellor Helmut Schmidt) at the time was the possible annexation by the then hostile East Germany (DDR) (Der Spiegel). But the politics prevailed, and considerable “gifts” were received by the local politicians; a flood-lit football field so that farmers could play night soccer after plowing their fields (which also served as a helicopter pad – just around the corner from the nuclear waste site), a conference center fully equipped to handle simultaneous translations (perhaps for the migrant workers to better communicate with their hundred or so farmer bosses? ), and an “information center” for the nuclear power company which pays a very, very generous rent which goes into the towns budget and pays for the needs – or perceived needs – of its public servants. There were fully paid cruises and other “gifts” which all helped pave the way for the final storage under the salt dome, with a few exceptions. The biggest exception was the refusal by two owners of large pieces of land – with its salt and mineral rights below – to sell to the nuclear waste company, at the time “Kernbrennstoff Wiederaufarbeitungs-technik GmbH” (KEWA). Now the transport cask storage installation, the waste storage installation and the pilot conditioning plant (PKA) are operated by the “Brennelementlager Gorleben GmbH”, a subsidiary of the “Gesellschaft für Nuklear-Service” (GNS), which in turn is majority owned by the energy companies E.ON, RWE and Vattenfall Europe (Wikipedia). 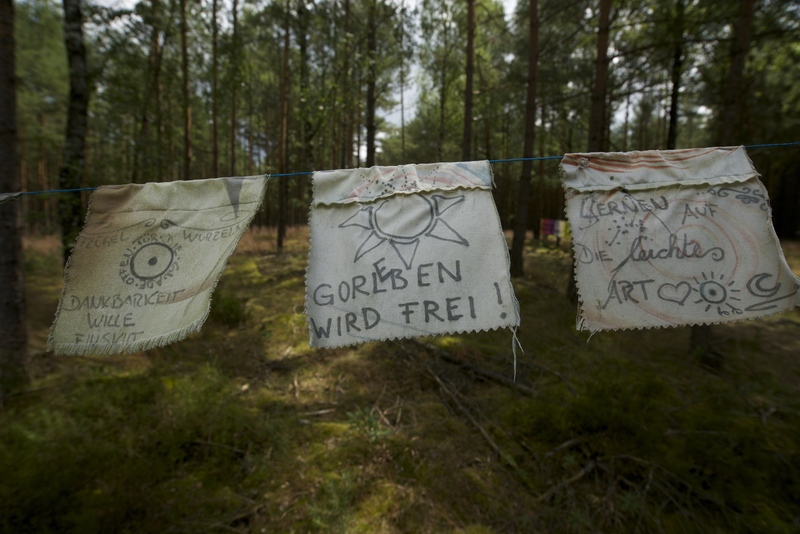 Peace flags hang between the trees at the site of weekly prayers – with a birds eye view clear cut through the forest to the entrance of the salt dome outside of Gorleben. The price offered was considerable for the 600 ha. needed for the nuclear waste disposal site, something in the region of then German Marks DM 35,000,000.- (ca. €17,500,000.-), this in 1978 (Zeit Online). More importantly Andreas Graf von Bernstorff purportedly leased parts of the family’s land to some hundred fellow protesters for symbolic amounts, making it both time consuming and costly if the government should choose to go to court and attempt to force the lease-holders and owners (now numbering more than one hundred and two potential legal suits) of the land to sell. Since 2013 it’s Andreas Bernstorff’s son Fried who has been handed the reigns of the “Bernstorff’sche Betriebe”, the family company that manages their properties. It was after watching a documentary from German television on Fried Graf von Bernstorff’s field trials using biochar that I became interested in the region, and the work of this young German Earl. The biochar field trials are ongoing, and have not yielded the expected results, yet. Nevertheless Fried Bernstorff has made the decision to make the considerable family holding 100% organic, going against the advice of many local conservative farmers. Whereas Andreas Graf von Bernstorff went against big business in the power sector, his son Fried (which translates to “Peace”) seems to go against big business in the agro sector. Could it be that the “Power of Polarity” has already switched to the silent hum of the fields and forests? And how will it be for the grandchildren of Christa Tornow, will they be harvesting fresh mussels in the Elbe? In Wendland, the roads built on the dikes provide a breathtaking view of the surrounding countryside. To summarize, these days in Wendland allowed me to experience “The Power of Polarity” in action, a concept that has been developing in my head for a few years, and come to maturity thanks to a real situation which is not resolved, but being “held” in a space. There are different views, different perspectives, and a level of respect between the people, while the Dialogue continues, and we can look forward to something new emerging, if we allow something new to emerge. My deepest gratitude goes out to the people of Wendland for their tireless dedication to preserving this little corner of paradise on earth for the generations to come. Again, Gail Tverberg manages to present valuable perspectives on our present energy, economy, and ecology predicament. The Wall Street Journal recently ran an article called, Glut of Capital and Labor Challenge Policy Makers: Global oversupply extends beyond commodities, elevating deflation risk. To me, this is a very serious issue, quite likely signaling that we are reaching what has been called Limits to Growth, a situation modeled in 1972 in a book by that name.